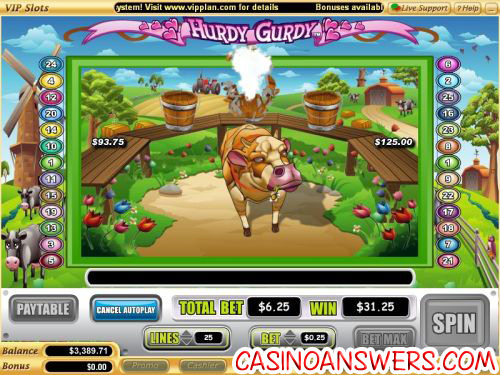 Hurdy Gurdy Video Slot Guide & Review - Casino Answers! Hurdy Gurdy is a 5-reel, 25-line video slot found at Vegas Technology casinos, featuring a wild substitute symbol, scatter wins, multipliers, a free spins feature and a bonus game. You can play the Hurdy Gurdy video slot at USA-friendly casinos Super Slots Casino and Online Vegas Casino. The theme of the Hurdy Gurdy video slot is a Western European farming family. The main character is an attractive young blonde girl named Hurdy Gurdy. Symbols on the Hurdy Gurdy video slot include Hurdy (wild symbol), Milk Pails (scatter symbol), Hurdy’s boyfriend Jahn, Father Gurdy, Mother Gurdy, Cow, Windmill, Tulips, Cowbell, Cheese, Waffles and Wooden Shoes. You can see a farm in the background, with cows, birds and a windmill. For a look at the Hurdy Gurdy video slot, a screenshot of the slot game is below. Bets on the Hurdy Gurdy slot machine are $0.01, $0.05, $0.25, $0.50, $1, $5 and $10 per line. You can enable from 1-25 paylines on each spin you make. You can make a bet as low as a penny on a spin or as much as $250 per spin, giving Hurdy Gurdy a wide betting range for all types of slots players from casual gamblers to high rollers. To play all 25 lines on the Hurdy Gurdy online slot, press the “Bet Max” button. For other wagers, you can use the “Spin” button to play. The Hurdy (blonde girl) symbol is the top payout symbol on the Hurdy Gurdy video slot. 5 Hurdy symbols on a selected payline will pay out the 7000 coin top jackpot. The Hurdy symbol is wild and will substitute for all symbols except for the Scattered Milk Pail symbol. Other exceptionally high paying symbols on the Hurdy Gurdy slot game are the Boyfriend symbol (3000 coins) and the Father symbol (1000 coins). You can win lots of cash by hitting these winning combinations when you play Hurdy Gurdy at Super Slots Casino! The Milk Pail is the scatter symbol on the Hurdy Gurdy slot machine. 2, 3, 4 or 5 Scattered Milk Pails will pay out 2X, 5X, 20X or 100X your total bet. When 3 or more Scattered Milk Pail symbols appear anywhere on the reels of Hurdy Gurdy, you will trigger the Pick & Win bonus feature. In the Hurdy Gurdy bonus game, you must select 3 Milk Pails for the cow to kick over and reveal prizes. The bonus game looks great, is animated and has sound effects. For a look at the Hurdy Gurdy bonus game, a screenshot is below. Whenever the Hurdy, Tulip and Jahn symbols appear anywhere on reels 2, 3 and 4 respectively at the same time, you will win 15 free spins with a 3X multiplier! This is an excellent free spins feature, but it can be hard to trigger. You can re-trigger the free spins feature. Free spins are played at the paylines and bet of the triggering game. Free spins feature wins are added to payline and scatter wins. Payouts are made according to the Paytable. Payline wins are multiplied by the bet per line. Scatter wins are multiplied by the total bet. Scatter wins are added to payline wins. Highest win only on each selected payline. Coinciding wins on different paylines are added. All wins occur on selected lines only except for scatter wins. All symbols pay left to right except the Scattered Milk Pail (which pays any). Hurdy substitutes for all symbols except for the scatter symbol. Hit “Autoplay” to open up the Hurdy Gurdy autoplay mode where you can select the number of spins (5, 10, 25, 50, 100, 250 or 500) and number of seconds between spins (0.25, 0.50, 1, 1.5 and 2). Stop settings are stop once all spins are complete, stop when jackpot is won, stop if a win exceeds or equals ($50, $100, $150, $200 or $250), stop on any win and stop if credits increase/decrease by ($50, $100, $150, $200 or $250). You can cancel autoplay on the Hurdy Gurdy video slot at any time. 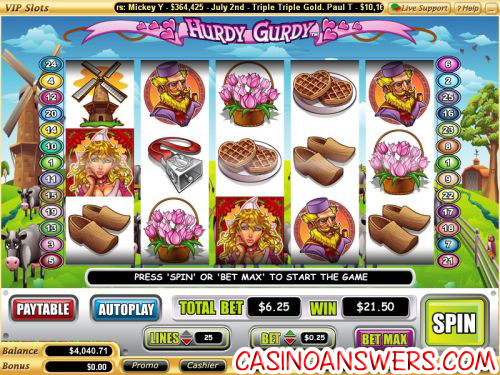 Hurdy Gurdy is a newer video slot to the Vegas Tech casino platform and a welcome addition. The bonus game and free spins feature are both great and will bring you some gigantic winnings. There are also some good regular slot game payouts on Hurdy Gurdy, which puts it close to the top when it comes to Vegas Tech video slots. To play the Hurdy Gurdy video slot, sign up and make a deposit today at Super Slots Casino! Can USA players play the Hurdy Gurdy video slot for real money? Players based in the United States of America are welcome to play the Hurdy Gurdy online slot game at any casino on our list of Vegas Tech casinos. Two of the best are Super Slots Casino and Online Vegas Casino. Can I find a free Flash game of Hurdy Gurdy at Instant Play casinos? Yes, you can play Hurdy Gurdy for free or real money at Super Slots Flash Casino and Online Vegas Flash Casino under “5-Reel Bonus Video Slots.” If you experience difficulties with the Flash software, make sure you have the latest version of Adobe Flash Player installed. How do I win free spins on the Hurdy Gurdy slot game? To win free spins on the Hurdy Gurdy video slot, you need to get Hurdy (the girl) on reel 2, the Tulips symbol on reel 3 and Jahn (the boy) on reel 4. It can be difficult to trigger, but if you pull it off, you will win 15 free spins with all of your winnings tripled!